Folstaf® Super Sturdy was formerly known as Volkstaf. Folstaf® Slim Lite was formerly known as Travlr. We are pleased and proud to have received a Backpacker 2006 Gear Guide Pick, though we do have a few corrections! Shoulder high? Only for people who like it that way! We have three sizes of Folstaf® Super Sturdy: 41 inch (short), 50 inch (medium), and 59 inch (tall). (see our sizing page.) And as for sturdiness we believe that the Folstaf® Super Sturdy swage and flare joints, 3/4" aircraft quality aluminum, double shock cord, and carbide tip will stand up against any other hiking staff in its class! 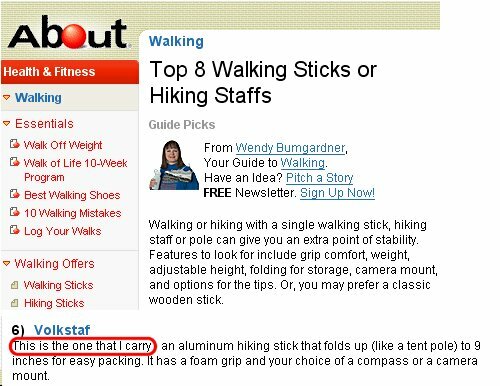 It's gotta mean something when the About Guide uses the Folstaf® Super Sturdy staff herself. Many of our customers are world travelers who find the compact and foldable Folstaf® Slim Lite Walking Staff and Folstaf® Super Sturdy Hiking Staff ideal for stashing in their luggage. "In this world of canned voice mail and automated DO NOT REPLY TO THIS ADDRESS emails and shipping notifications you are a true breath of fresh air - maybe it's those Rocky Mountains. My fear is that people will soon forget what it's like talking to a real - and friendly - person." "My sister and I had an opportunity to use the walking sticks yesterday at the Twin Cities Classic car show. The event is held on the State fair grounds and there's lots of walking, lots of people, and 12,000 classic cars. We were both so pleased with the Travlrs. We carried them there in our purses and like magic, opened them when needed. They were perfect with all the people around and on the uneven ground. Not having seen this product before actually ordering it, I was so happy to find it exceeded our expectations. And your excellent help and pleasant, cheerful way of conducting business made the icing on the cake!" "I just wanted to touch base with you now that I have had an opportunity to use the Volkstaf Hiking Staff extensively over the course of my vacation. Last year, prior to the purchase of my Volkstaf, my wife and I went on our Honeymoon hiking vacation to Cape Breton Island located in Nova Scotia, Canada. At each trailhead we selected a natural wood staff thoughtfully left behind by other hikers after returning from their hike. While heavy and cumbersome it was certainly better than nothing. At every trailhead was an official Government sign advising hikers to use a hiking staff both to aid in navigating the rugged trails and as self defense in case of a coyote encounter. After returning home I started researching hiking staffs and Volkstaf recommendations seemed to be quite common. I called Rocky Mountain Amblers and spoke to Ruth who guided and advised me in selecting a staff. I ordered two, one for myself and one for my wife. I am 6ft - 200 lbs. and my wife is 5ft.7in. - 150 lbs. and we both selected the medium model. This year we returned to Cape Breton for our anniversary hiking trip and used our Volkstaf�s just about every day. We hiked all kinds of trails with most graded as moderately difficult. The Volkstaf�s preformed flawlessly and afforded a sure grip every step of the way. Never have I been so overwhelmed by a purchase that I have taken the time to write a recommendation but I wanted others to know how much I thought of this product. The Volkstaf is very light yet extremely overbuilt and likely will last a lifetime. 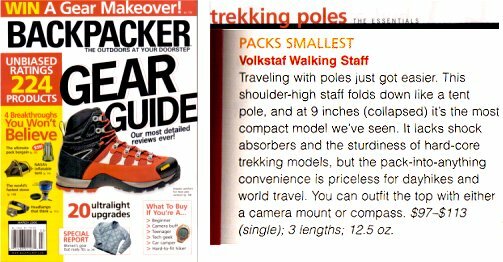 If you are serious about hiking I suggest you call Rocky Mountain Amblers and order a Volkstaf today!" "I am back from my trip and I wanted to let you know I couldn't have done some of the extensive hiking without my Volkstaf. We were in the mountains of Turkey and my pole was a god-send especially in some of the areas where there was remnant ice and snow. It remained my constant companion, either in use or tucked in my backpack, for the entire trip. As an aside, there was absolutely no problem, or even any questions, about the pole going through security at the numerous airports." "I want you to know that I received [my Volkstaf] yesterday — which is virtually a land-speed record, given that I ordered it on Saturday. Thank you for the incredibly prompt service. I haven't tried out the Volkstaf "in the wild" yet, but I am super-pleased by the product. It is incredibly lightweight, yet strong. I intend to use it while hiking in Rwanda this summer, and to use the camera mount to assist in getting great pictures of the Mountain Gorillas and other wildlife. "Thank you for your helpful and prompt service. Our staffs arrived safely after a wait in UK customs, and we took them to Portugal last week. They proved fantastic. Easily portable through the airports yet strong when we needed them going down rocky paths in the Algarve. Thank you again." "First, I want to say that your walking sticks were great to have for our trip to the Galapagos last August. We had two excursions/hikes a day for the week we were on Celebrity's Xpedition. They were wonderful to take along in our backpacks since they are lightweight and foldable. They will be sure to go with us wherever we travel! I will highly recommend your company to everyone I know who may need a sturdy and dependable walking stick. " "I hiked over 100 miles this summer with my Volkstaf poles. They were perfect for the rugged, rocky and steep treks. And I love how they fold into a small neat package that fit easily into my backpack and suitcase. I highly recommend these poles, they are great!" 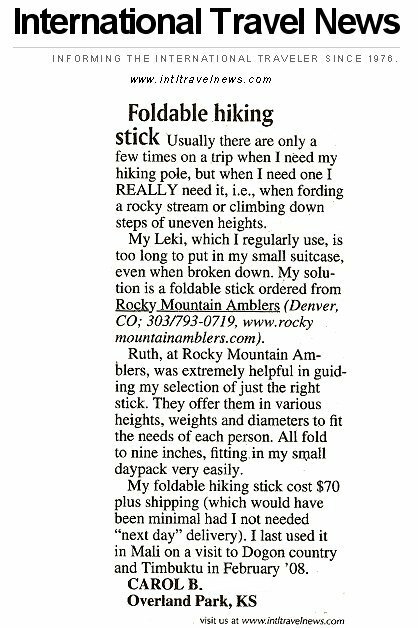 "
"My Travlr walking stick arrived two days ago. I used it yesterday on a short walk and up some hills. It was wonderful. The size and weight are great and I know it will make my trip and future hikes much more enjoyable. Thanks for your help and speedy delivery." "The ease of use and quality of the Volkstaf exceeds my expectations. Your customer service is as good as your product." "Very cool and very sturdy. I'm impressed with the level of 'beefy-ness' - real quality!" "When my wife discovered that she could carry a staff with her hands free and with no extra weight, there was no reason not to have one. The confidence of knowing that if you encounter difficult or unusual conditions somewhere along the trail, you can unfold your Volkstaf® and have immediate safety, gives us a great amount of comfort." "Just wanted to let you know how much I loved the trekker [Travlr] on my trip to Greece. Climbed everywhere with it - including up to the top of the Acropolis in Athens in 90 plus weather and never broke a sweat. It easily stowed in my purse each day. "From the slippery red slopes above Kauai�s Na Pali coast to the chunky lava rocks in Hawaii Volcanoes National Park, our Volkstafs kept us upright and surefooted. They made our hikes easy and our packing easier. We enjoyed them and look forward to taking them on more great adventures." "From the deep subways of New York to the steep bridges of Venice to the side streets of Kyoto, the Travlr® has been my dapper companion. It's the first thing I pack in my carry-on flight bag and it's the first thing I unpack." "Light as a feather - looks wonderful and VERY travel friendly!" "Volkstafs® are perfect – lightweight, sturdy, easy to unfurl and re-fold, comfortable to use. A side benefit: it's perfect for spearing Magnolia leaves that fall into the rose beds." "The Travlr Staff worked great in the Galapagos. It was very convenient, easy to keep in the backpack, sturdy and solid. Thanks for a great product."